We are pleased to cooperate with Sahitya Pravarthaka Saharkarana Sangham (SPCS) and the inaugural Krithi International Festival of Books and Authors with a poetry encounter between poets from Europe and Kerala, and public events in Kochi, Thrissur and Thiruvananthapuram. 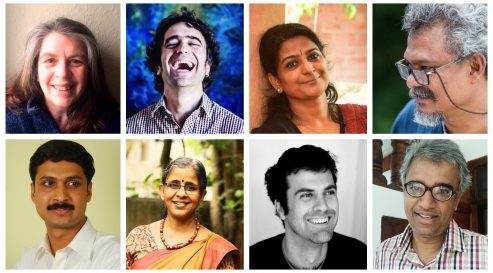 Leading Malayalam poets Anitha Thampi, Anwar Ali, V. M. Girija, Pramod KM and P Raman will participate in an encounter with Vanni Bianconi (Switzerland), Siân Northey (Wales, UK) and Martí Sales (Catalonia, Spain) to discuss and translate each other’s poetry and meet Kerala audiences in three cities. The encounter will be facilitated by LAF director Alexandra Büchler and poet, writer and translator Sampurna Chattarji. Literature Across Frontiers have been connecting literary Europe and India for almost a decade through workshops, public events and encounters between literary and publishing professionals and in particular through its Poetry Connections programme. The project is hosted by the SPCS and supported by the Government of Kerala, Arts Council Wales, Institute Ramon Llull and Pro Helvetia – the Swiss Arts Council.